WomenSportsWeek takes place this June. We're already preparing for it with our ACTIV8aFriend 'nudge' programme.ACTIV8aFriend is all about inviting ('nudging') your mother, daughter, sister, auntie, neighbour or work friends to get ACTIVE with you. 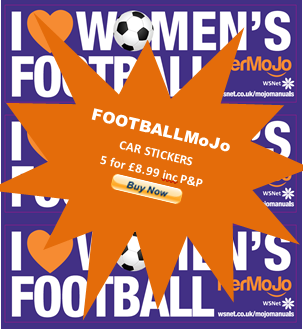 All the research shows that women enjoy sport more & get ACTIVE if they do it together. ACTIV8aFriend gives you the chance to invite a friend, set up a try day or just try a new sport. We provide all the material (posters, vouchers etc.) for you to run your own TRY DAY at your club or class? More info below - full launch on 17th May - visit us then or sign up above for our newsletter. POSTER - download your sport's poster (pdf) & plan a WomenSportsWeek TRY DAY - print the poster and write the details in the space provided. Or you can create a word doc and over-print onto the printed pdf. 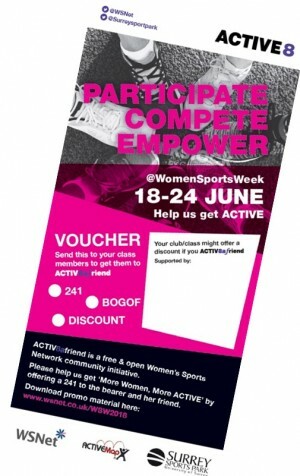 ​VOUCHER - download the 'discount' voucher on the right and send it out to your female members - for them to 'nudge' & invite to your club during WomenSportsWeek! Or try taking it to your local fitness class . . . . with your best friend, sister, mum, daughter, neighbour . . .
Let us have your sport or fitness videos - we will programme them to go out one every hour to our 100k twitter community throughout #WSW2018 - and we send out a link to YOUR video as part of our free support for clubs/classes like you. ACTIVE - just how you want - with friends usually in convenient 'packets' of time near where you are.